The tiger cub scratched his ear with his claws. He sat in the dirt, his long tail waving back and forth. "I’d like to take a nap, but it’s too noisy," he said to the lion cub. "Noisy? I can’t hear anything. There are no monkeys crying. I can’t hear any elephants. I don’t even hear any roars from the other lions," Aba laughed. "You can’t hear all the noises?" Juma asked. "No! I just told you, I don’t hear a thing," Aba replied. "What sort of noises do you hear?" "Soft noises, but a lot of them," Juma said. He looked around. "Aha! I see who is making all the noise." Aba laughed. She couldn’t see a thing. "I can’t hear a thing. 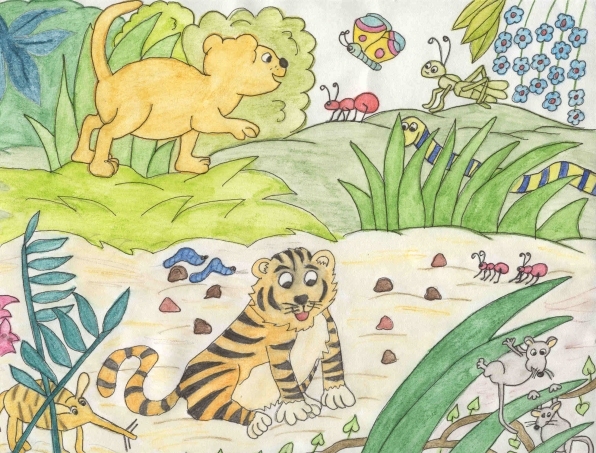 I can see flowers and leaves and I can smell the zebra and gazelle on the savanna." The lion cub was confused. "See those ants. That’s Zina and Pemba. Listen to them! They’re running across the ground, making all sorts of noise," Juma said. Aba bent over and put her ear near the ground. "Can’t hear a thing. I see the ants though." "What about Safiya? Can you hear her? She’s slithering through the leaves and she’s very noisy," Juma said. Aba moved the leaves apart and saw the snake. "Safiya, where are you going?" she asked. "Off to the river," the snake hissed and slithered away. "I don’t think she was making any noise. She’s very quiet," Aba said. "I could hear her body slipping across the ground. It was nearly deafening to me," the tiger said. "See the butterfly? Her wings are flapping up and down." Juma put his paws over his hears. "Stop it! You’re being too noisy!" Aba listened carefully as the butterfly fluttered past. She couldn’t hear its wings flapping up and down. "See the worms over there," Juma said, pointing to two fat worms inching their way across the dirt. "They sound like elephants." Aba sniffed the worms but heard nothing. A grasshopper hopped by. "I suppose you hear that too," Aba said. "What about that anteater over there?" Aba asked. Juma watched the anteater walk past. Its long snout was twitching as it searched for ants. "It sounds like a herd of lions snoring. Zina and Pemba, you’d better get out of here quickly," the tiger warned. The two ants ran into the bushes. "Hey, Juma, can you hear us?" two mice called. Chiamaka was hanging from a leaf by his arms. His feet weren’t touching the ground and he wasn’t making any noise. Keisha was holding onto another leave. The only sound coming from her was her whiskers wiggling in the gentle breeze. Juma listened. "How do you expect a tiger cub to get a nap around here with all this noise. I need a nap! I’m going down to the river. Maybe it will be quieter around the hippos and crocodiles," he said and ran off. Aba shook her head. "I don’t know about Juma, but I think it’s quiet here. She curled up in a ball and fell asleep, listening to the gentle sounds of the savanna.